From the Outreach Revolution Series: sign up to get shareable social media graphics, learning experiences, and join other UU outreachers like you. Is there such a thing as being too public about your values? The world today can feel like a hard time to reach out, given the uncertainty in the news, on social media, and in our hearts. But the truth is, it’s never been more important to get out there and be our progressively faithful selves, even when that’s imperfect. Yes, that takes courage. You bet it requires risk. Just remember that inaction carries its own risk in this historic time in American public life. Attendance is up at many churches, a sure sign that our message is a needed one. How can we honor that need and answer its call? We want to highlight two opportunities to help frame and support the work you are doing in your community – the Love Resists campaign and the UU White Supremacy Teach-In. These are two ways that the UU faith tradition is finding traction in these days of churn and change. 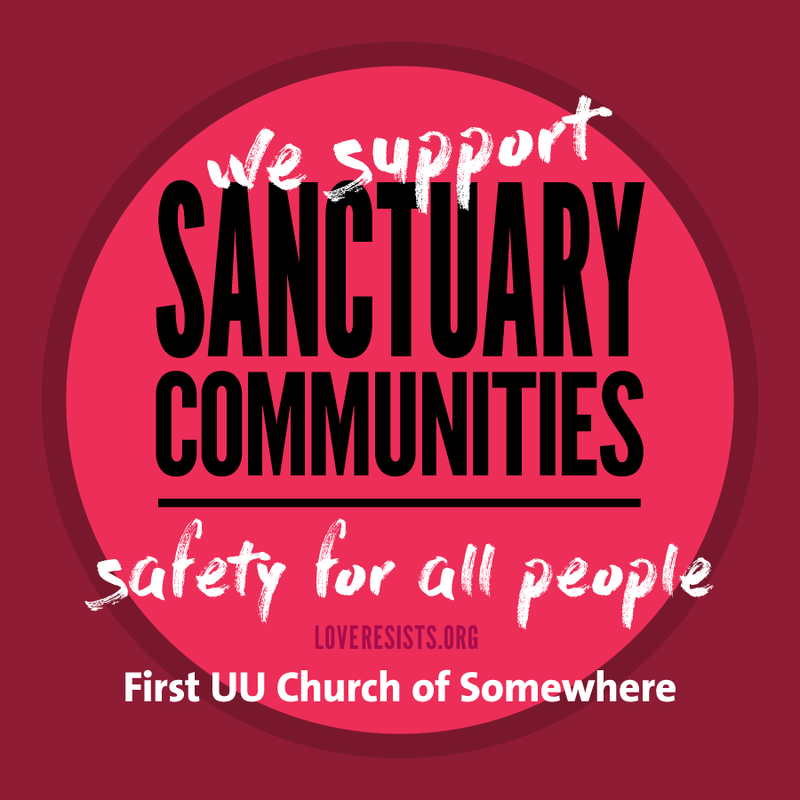 Started as a joint initiative between the Unitarian Universalist Service Committee and the Unitarian Universalist Association, Love Resists offers tools, tips and connections to help expand the notion of sanctuary in our communities, grow our solidarity with oppressed communities, and raise our voices for justice. The campaign models partnership and collaboration from the bottom up, drawing heavily on the framing and guidance of our community organizing partners. This month’s social media graphics come from Love Resists, and are a great way to show your support for expanded sanctuary policies, rapid response networks, physical shelter, and more. Download all eight graphics. We hope you’ll share them! And when you do, it’s a great opportunity to talk about what commitments you’ve made to help expand sanctuary and create safe spaces for those most under threat. Perhaps you’re advocating for your local school district to refuse to cooperate with immigration orders, or members of your congregation are accompanying undocumented folks at their regular check-ins with Immigration and Customs Enforcement, or maybe you’re part of an interfaith coalition offering physical sanctuary in one of your congregations. Regardless, it is so important to be public in our work for justice right now, to show that people of faith and conscience are invested in a different vision for our communities. Visit loveresists.org for more information. You may also know about the grassroots UU White Supremacy Teach-In, just wrapping up its two weekends of disrupting “church as usual” to focus on the racial injustice and cultural whiteness of our faith. With nearly two-thirds of UU congregations participating, the Teach-In is a powerful testament to Unitarian Universalists’ shared desire to build a new way forward and reach new audiences (and kudos to religious educators and event organizers Aisha Hauser, Christina Rivera and Kenny Wiley!). If you didn’t sign up for the Teach-In, remember it’s never too late to talk about decentering whiteness :). If you’ve completed the Teach-In, find a next activity for your congregation (see the “next ask” recommendation from our Entry Points post) to show how you’re carrying its lessons forward. I’ve heard some people wonder if a focus on examining our internal white supremacy will turn off spiritual seekers. I feel pretty sure we aren’t going to turn people off with heartfelt internal discussion; instead we will help outsiders understand how seriously we take our values. In a time when trust of institutions like church is weak, especially for younger folks, it’s critical that we show we’re serious about practicing what we preach. There is no more distinction between what happens backstage and what is thrust into the spotlight, this is the era of leadership in the round. Both Love Resists and the White Supremacy Teach-In are an opportunity to “show, don’t tell.” Instead of just talking about our principles and commitments, we are embodying them with clear action. It can’t be overstated how important this is in the era of 24/7 social media transparency. Make sure you’re Tweeting, Facebook-ing, and talking about the work you’re doing, so that your light may inspire others to let theirs burn bright. I am committed to Unitarian Universalism because of its aspirations for a just, compassionate, beloved community for all. If you believe that more people hunger for this vision, show them you mean it. There’s no such thing as being too public about your values days. How are you showing your values these days? Add your thoughts to the comments below.